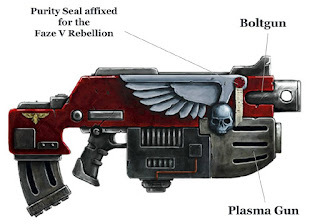 Fields of Blood: 40K - Combi Plasma - Single Shot or Whole Hog? Over the weekend I was playing around with the Mathhammer app on this site trying to determine what was the most efficient way to use a Combi Plasma. EDIT: This is a Fake Combi Plasma. Sad! Lucky Somebody Out There Is A Combi Scientist! You have two options. Firstly you can shot either weapon alone or secondly you can fire them both together. If you choose the second option then if you are a MEQ you hit on a 4+ rather than a 3+. Now I knew that one of the two options would be better than the other. My gut feel that hitting on a 3+ with the Plasma was probably better than hitting on 4+ with both the Plasma and the Bolter. And I guessed that this would also be target-dependent. Well I was part right. I ran the maths for all combos from T3 to T8 and from 2+ Save to No Save. I also worked the numbers for things like Prescience which give you +1 to your To Hit rolls. Rather than go through the maths, I'll jump to the useful part.....the outcome! Unless your target has an Armour Save of 3+ or less or is T 5/6 with a 4+ Armour Save then you are better to shoot with both the Plasma and Boltgun. Unless your target has an Armour Save of 2+ or is T 5/6 with a 3+ Armour Save then you are better to shoot with both the Plasma and Boltgun. So a reliance on Plasma-alone only works best for heavily armoured targets, particularly if your To Hit roll is enhanced. Remember this is purely in terms of D 1 shots and doesn't take into account Invulnerable Saves. I'm pretty sure if you are looking at multiwound models and you do get Prescience off then your best option will definitely be single shooting Overcharged Plasma. The big issue for overcharging plasma with a to hit penalty is that any '2' you roll doesn't get to re-roll if you have a re roll '1's ability. Then the modifier is applied and it goes to a 1 and you lose the model. Due to modifiers being applied only after all re rolls are triggered. So for me, as I'm running expensive models with plasma (bikes), I would never overcharge with a to hit penalty unless 1) I really needed something dead and was prepared to lose models or 2) I have a global re roll somehow.